Most voters overlook the Primary Election as unnecessary or unimportant—many people believe that only the General Election really matters. Contrary to popular belief, in Arizona, the Primary is more important than the General. The Primary Election provides a platform for voters to vet the best and worst candidates, and to decide who will represent their party in the General. Without your vote, and the vote of several others who don’t realize the importance of the primary, a potentially valuable candidate that represents your interests could lose their opportunity to make a change in the state. The Primary determines who will represent your party and your region in the General election and potential in an elected office. A weak candidate in the General could cost a party their seat in the House or Senate, which will ultimately determine the legislative body’s agenda and which bills will come to fruition. In today’s political landscape where most votes are decided by one or two key lawmakers, missing the opportunity to vote for your candidate means that you’ve lost your representation. As a nation that prides itself on individual liberties, freedom of speech, and democracy, we should be exercising our right to vote in every single election at all levels of government. Unfortunately, this is not the reality for most voters. In Arizona’s 2016 Primary Elections, only 29.6% of registered voters cast a ballot—that’s less than 1 in 3 people in the state that made their voice heard in this imperative part of the elections process. In 2014, a mere 27% of registered voters exercised their right to vote in the Primary Elections. 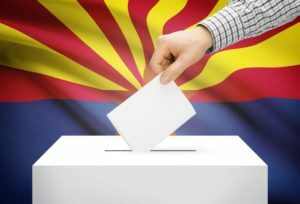 Approximately a quarter of Arizonans decide which candidates make it through their party’s Primary Election. And, in this state, many candidates won’t face a serious challenger in the General Election. For several races across the state, the primary election is where candidates are chosen. According to a study by Pew, while the majority of Americans classify themselves as politically moderate, the most polarized voters go to the polls in greater numbers, especially in primaries. The smaller the voter pool becomes, the more weight a single vote carries and the easier it becomes for an active, partisan minority to determine an election’s outcome. In these cases, the primary can act as the de-facto general election, as the winner often coasts to an easy victory in November. If the nominee (and eventual General Election victor) is chosen by a highly-polarized, restricted primary voter pool, he or she is likely to push the government ever deeper into narrow-mindedness and gridlock. Local politics may not have the drama and excitement of an episode of House of Cards or the West Wing, but they matter. In fact, the decisions made by your local city council or at the state legislature are more likely to impact your daily life and your business than policy changes at the national level. The 2018 Primary Election is quickly approaching on Tuesday, August 28 and the deadline for voter registration in the Primary is July 30. Make it your priority to register and cast an informed vote in August. Check your voter registration status and register to vote at: www.servicearizona.com. Participating in the political process by voting is one of the best ways you can help shape Arizona’s future. Learn how your vote has an impact.